The Alexis Creek Region in BC. Alexis Creek is located on Highway 20, 114 kilometres west of Williams Lake and was named for Chief Alexis, who was the Chief of the Chilcotin tribe during the Chilcotin War. The small community has some amenities and a Forest Service Office for the area. You can access Alexis Creek along the main route, Highway 20, or go in from the back way by turning at the Highway 20 junction at Riske Creek. 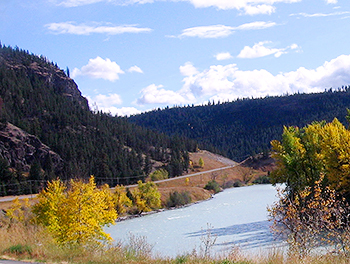 From there the road winds 19 km or 12 miles to cross the Chilcotin River at Farwell Canyon. The canyon is a spectacular site, with tall sandstone hoodoos carved by the river into fantastic shapes over eons. The area was once the site of an ancient native village and pictographs carved into the cliff face south of the bridge are a fascinating attraction. Continue on and you will come back out at Hanceville or Lee's Corner, just east of Alexis Creek. Along the way is the Gang Ranch, once vying for position with the King Ranch of Texas as the largest ranch in North America, it is still the second largest in Canada. West of Alexis Creek are Bull Canyon and Battle Rock, sites of numerous fierce battles fought by the Chilcotin, who were defending their territory against invasions by the Shuswap and Bella Coola tribes. 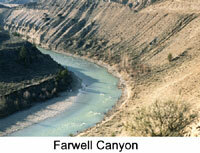 Bull Canyon is about three miles in length, now reserved as a park with the river cutting through it. It turns off right next to the highway down to the beautiful glacier colored Chilko river and is a great stoppping point with overnight camping and picnic tables. Along th e sheer rock cliffs on the north face of the canyon across the road, you will see many caves, some said to have held grizzly bear skulls, arrowheads, and old weapons from earlier wars fought there between the tribes. 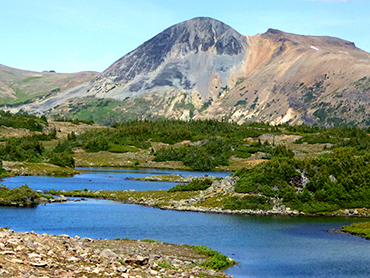 Legend has it that once the Chilcotins were camped fishing upriver when a young buck set off down the valley. On seeing a glow above the Bull Canyon wall, he crept around to investigate and found a full camp of Shuswap warriors. He quickly returned to his tribe to alert them. They stole up the mountain behind the Shuswap, attacked and forced the Shuswaps over the bluff, killing most. Human remains were found in the shale by road building crews mid 1940s. 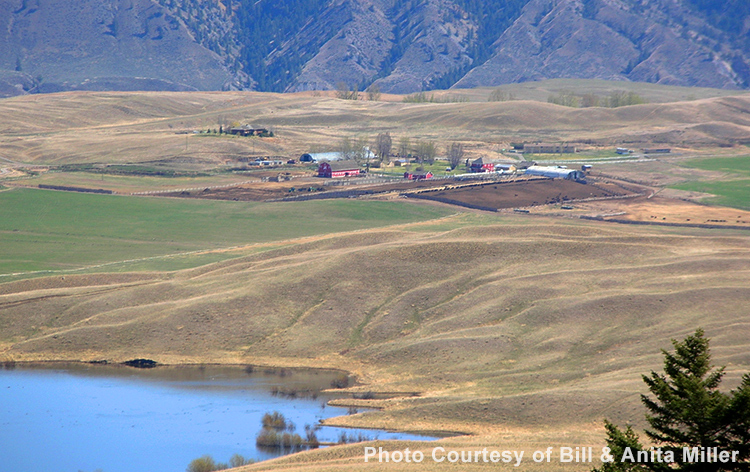 The area has some of the richest ranch land in the Chilcotin, with miles of rolling natural pastureland, ideal for cattle and rich bottom land near the river. A plentiful water supply allows for extensive irrigation. 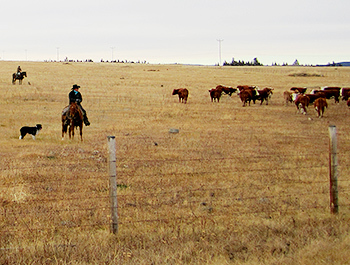 Cattle roam for miles on open range, and you'll still see the old fashioned cowboy using horses to ride herd on the cattle, brand in the spring and gather them up in the fall. The area supports numerous lakes with excellent fishing, while rivers offer world class flyfishing. You'll find top flight river rafting, hiking, trailriding, hunting, snowmobiling, birdwatching and so much more here. 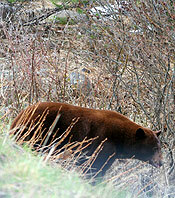 You'll also see lots of wildlife. Deer abound here, as do cougar, black bear and moose offering terrific opportunity for both amateur and professional photographers. 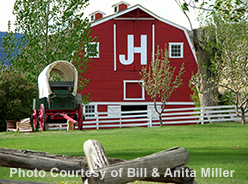 The Gang Ranch is the second largest in Canada after the Douglas Lake Ranch, also located in BC.